Vanuatu carries hand and net caught fish only. They run high as the freight from Vanuatu is such. They hand catch many abberants and mutants, hybrids, super rarieties, and XL fish, for which they charge a premium. Their location alone gives them many species not often found on lists elsewhere. It may be that the fish you have been looking for and can&apos;t find is from here, most places don&apos;t carry Vanuatu. It is not for price shoppers, but for connoisseurs. Pending the sizes of the fish, there are usually 6, 12, or 24 fish in a box. Groucho Angel - Centropyge sp. Smokey Groucho Angel - Centropyge sp. Red Crested Angel - Centropyge sp. Fusiler Anthias	- Pseudanthias sps. Banded Red Goby	- Trimma sps. Clown Goby - Gobiodon sps. Crested Blenny - Istiblennius sp. Purple Tilefish	- Hoplolatilus sps. Redfin Goby - Ptereleotris sps. Red Sandperch - Parapercis sps. Red Scooter Blenny - Synchiropus sps. Scooter Blenny	- Synchiropus sps. Skunk Tilefish - Hoplolatilus sps. Spotted Blenny - Blenniella sps. Striped Blenny - Ecsenius sps. Striped Goby - Amblygobius sps. Torpedo Goby - Malacanthus sps. White Head Goby	- Bathygobius sps. Assorted Butterfly - Chaetodon sps. Variagated Cardinal - Fowleria sps. Banded Damsel - Stegastes sps. Electric Blue Damsel - Pomacentrus sps. Electric Gregory - Chrysiptera sps. Green Chromis LG/XL - Chromis viridis 2-3"
Jewel Damsel - Pomacentrus sps. Neon Damsel - Pomacentrus sps. Whitetail Damsel - Pomacentrus sps. Black Ribbon Eel - Rhinomuraena juv. Blue Ribbon Eel - Rhinomuraena sps. Common Eel - Gymnothorax sps. Moray Eel - Gymnothorax sps. Common File - Cantherines sp. Emerald File - Paramonacanthus sp. Yellow File - Cantherines sp. Common Goatfish - Parupeneus sps. Hind Grouper - Epinephalus sps. Honeycomb Grouper - Epinephalus sps. Leopard Grouper - Cephalapholis sps. Pygmy Longfin - Plesiops sps. Pygmy Longfin LG/XL - Plesiops sps. Purple Basslet - Pseudochromis sps. Baby Barracuda - Sphyraena sps. Bronze Squirrel - Neoniphon sps. Crocodile Fish - Cymbacephalus sps. Deepwater Squirrel - Neoniphon sps. Diamond Ray - Dasyatis sps. Lizard Fish - Synodus sps. Sargasso Fish - Histrius sps. Assorted Parrot - Scarus sps. Green Parrot - Scarus sps. Deepwater Puffer - Canthigaster sps. Papauan Puffer - Canthigaster sps. PeeWee Puffer - Arothron sps. Black Tang - Acanthurus sps. Bristletooth Tang - Ctenochaetus sps. Arrowhead Wrasse - Wetmorella sps. Blackfin Fairy Wrasse Female - Cirrhilabrus sps. Blackfin Fairy Wrasse Male - Cirrhilabrus sps. Common Assorted Wrasse - Halichoeres sps. Flame Fairy Wrasse - Cirrhilabrus sps. Flasher Wrasse Male - Paracheilinus sps. Flasher Wrasse Female - Paracheilinus sps. Longface Wrasse - Hologymnosus sps. 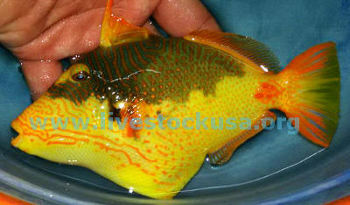 New Cal Leuco Wrasse - Halichoeres sps. Pinkface Wrasse - Halichoeres sps. Rooster Wrasse - Pterogogus sps. Scissortail Wrasse Male - Pseudocoris sps. Scissortail Wrasse Female - Pseudocoris sps. Snooty Wrasse - Oxycheilinus sps. Vila Fairy Wrasse Female - Cirrhilabrus sps. Vila Fairy Wrasse Male - Cirrhilabrus sps. Weedy Surge Wrasse - Halichoeres sps. Many come 1, 2, or 4 to a box, pending size. Green Parrot - Scarus sp. Leopard Grouper - Cephalapholis sp.